Yesterday was the toughest road ride of the season for at least BF and I. Homey may have had harder rides this year at the hands of the Portland crew but not me. After riding a good 20 on Saturday in heavy rains, the legs were a little tight on Sunday starting out. We expanding the ride we did 2 weeks ago so the start was the same. We hit the hills early. The expansion came as we headed towards Templeton. Holy Cow, those were some fantastic hills…one right after another. BF actually walked some of way up one nasty 15% hill. We rested at the top of that one as even Homey was breathing hard. We then continued through Baldwinville and into Winchendon before heading back home. We had one good flat stretch into Winchendon were we picked up our average. Homey does a great job of pulling us on those stretches. I pulled some and BF pulled us down a couple hills. Let’s face it, more weight…faster down the hill. We took a detour off RT140 onto a bike trail. It was a nice break as 140 has a LOT of traffic on it. There weren’t a lot of people on the bike path and it did start to sprinkle for a bit while on it. Here is the course detail. We went 44.54 miles in 2:36:51 ride time averaging 17.0 mph for the ride. At one point I hit a max speed of 41.8 mph. For those of you that have never ridden a road bike, that is pretty fast on some really skinny tires. 🙂 This ride on a much more hilly route was faster than 2 weeks ago so we must be getting some lungs and legs beneath us now. I burned about 2818 calories. No wonder I was famished when I got back home. We were out there for about 3 hours total with only a couple packages of Scooby Snacks for me. I downloaded a new software update on my Garmin so the elevation chart looks more realistic for this ride as opposed to the other rides I recorded. Here is the elevation chart for this ride. So, about 65 miles total this weekend. That will help us for Gloucester next week. There really isn’t any big grades on that course that we could see, so we are hoping that Sunday’s 45 hilly miles will somehow equate to 62 fairly flat ones. Here’s hoping we are correct in this assumption. See you Thursday on the mountain bike. here is my best estimate of elevation change based on http://www.usatf.com and guessing where i couldn’t quite tell what road we took. 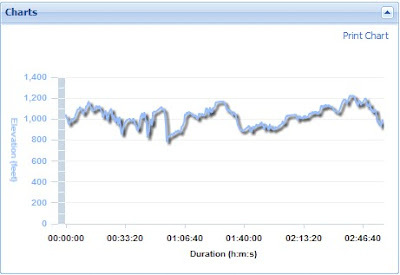 Does the Garmin only show elevation change or can you also get total climb and total change #’s? Great work yesterday as I was pretty spent after some of those hills and having you pull on the flats for awhile was awesome. BF down hill is even better then me leading down hill!